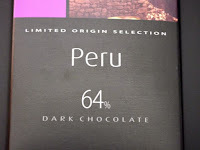 Today was Day #3 of Chocolate and Peru Theme Week. 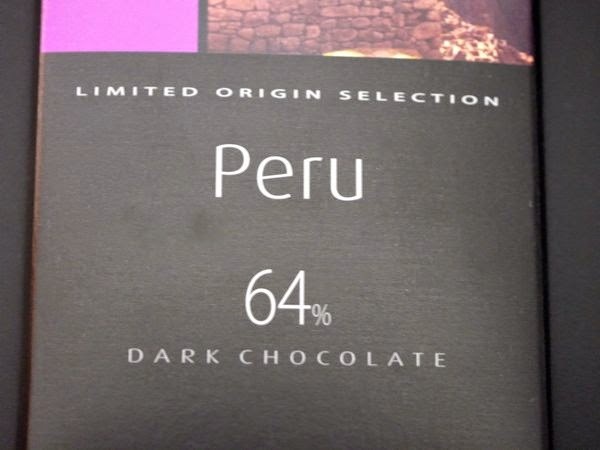 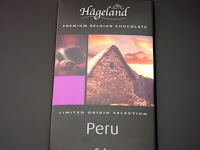 The Hageland Peru 64% dark chocolate bar was made in Belgium by Kim's Chocolates. I agree with the tasting notes printed on the packaging: "An unmistakable hint of fruit, with a slightly bitter cocoa taste, creates a surprising first impression..."
There was some fruit/acid that gave this bar some oomph/interest, and a bitter flavor that, surprisingly, didn't linger too long or spoil the experience.